These flowers used to be permanent fixtures in my small garden. I had the lone shrub for years and it produces such lovely white flowers every year. Some months ago, the leaves slowly turned yellow then they dried up to brittle brown ones. This afternoon, my son and I decided to finally put it to rest so what is left now is a small stump of the trunk. My gardenia is gone. All I have left are random photos of its flowers. Funny but I still could smell their heady scents from here. Posted on April 30, 2017, in flowers and blooms, photography, simple life and tagged journeys, life, My gardednia, nature, photography, silence speaks. Bookmark the permalink. 12 Comments. Oh, I am indeed sorry you have lost this treasure. Is there any chance it might grow back from the root? Plants surprise us sometimes. 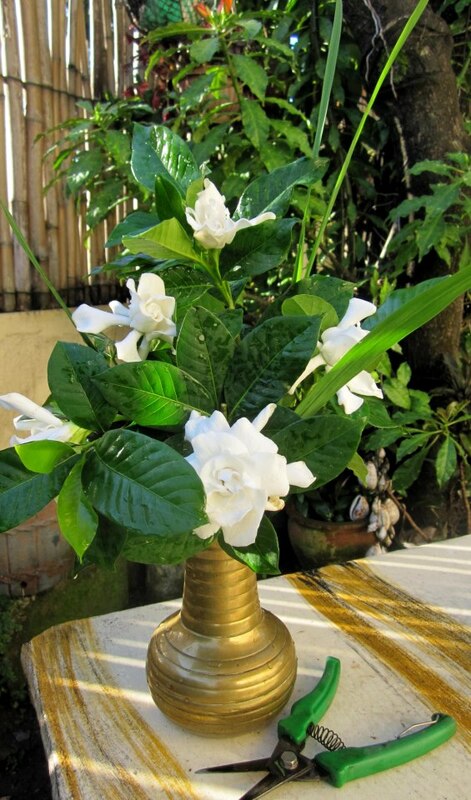 How wonderful to have been able to grow and cut gardenias. I’ve only ever seen them in the florist shop. Their fragrance is heavenly. Wishing you the best of luck. Thank you Kathryn. Hopefully, it would have new stems again but I am not so sure of it. Part of the trunk has dried up. I love those fragrant flowers too. they are so good as flower arrangement. Such a shame to lose your lovely gardenia. The display in the vase looks beautiful. I will miss all those lovely blooms. The smell will always remind me of a corsage I had at a college dance. Lovely. I think these blooms used to be so popular back then. We call this Rosal. It’s one of my favorite flowers. Thanks for sharing! Yes, it is Rosal. You’re welcome Milai. I adore gardenias, and your photo of this one does it justice. I’m not a great gardener and I rarely take photos, so I’m enjoying your site. I hope your plant comes back. Thank you so much. you can visit my other blog called Colors. It’s all about taking photographs. Thanks again Sharon.